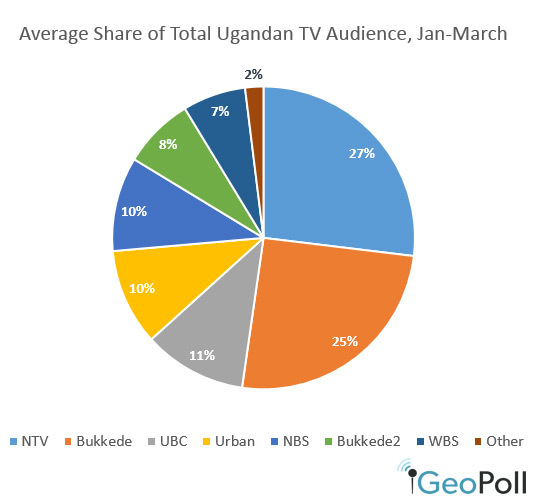 Using the daily data collected through GeoPoll’s Media Measurement Service, GeoPoll has analyzed the top TV stations in Uganda for the first quarter of 2015, from January 1 – March 31. We examined both ratings* and share** for the top stations in Uganda. The below chart shows the average ratings for the top 5 channels in Uganda during peak viewership time. As you can see, during each half-hour period, NTV and Bukkede are the clear leaders. At the beginning of peak viewership time, NTV has a slight edge over Bukkede, with an average rating of 5.01 and 4.42 at 7:00pm and 7:30pm. 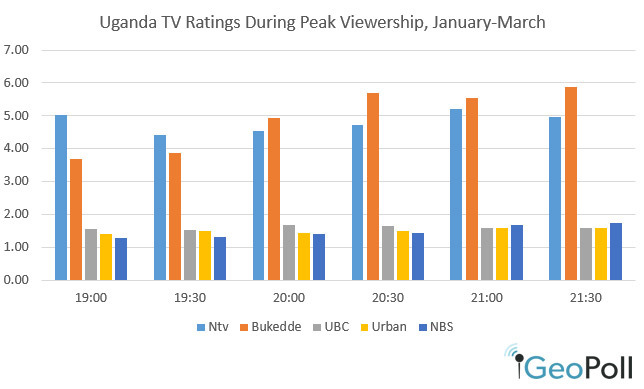 At 8:00pm, Bukkede’s ratings surpass NTV, and from January-March, Bukkede had the lead over NTV from 8:00pm – 9:30pm. Bukkede’s peak viewership time during this period was at 8:30pm, with an average rating of 5.69. The other channels that make up the top five, UBC, Urban, and NBS, are far behind Bukkede and NTV. UBC’s highest viewership for January-March came at 8:00pm with a rating of 1.69, Urban’s at 9:30pm with an average rating of 1.60, and NBS’ at 9:30pm with an average of 1.73. We also looked at the average share of the top TV stations in Uganda. Share represents the percentage of people viewing TV at that time who are tuned into each channel. From January – March, NTV had an average share of 27%, and Bukkede had an average share of 25%. UBC had a share of 11%, Urban and UBC both had a share of 10%, and Bukkede2 and WBS had a share of 8% and 7% respectively. All other stations accounted for 2% of share.